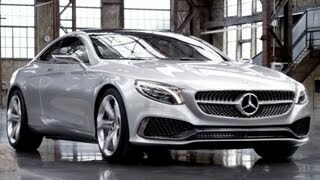 Mercedes has released a concept version of the 2013 Mercedes-Benz S-Class Coupe at the 2013 Frankfurt Motor Show. The concept has a gorgeous appearance and self-assured style making it an automotive masterpiece. The S-Class Concept gets a long bonnet with distinctive lines and powerdomes, a diamond radiator grille, full LED headlamps, stretched roof line, frameless doors, three-dimensional chrome frame surrounds the glass areas that are uninterrupted by B-pillars and accentuated wheel arches as well as the 21-inch wheels. On the interior the white instrument panel exudes sensual clarity. Its curved shape is reminiscent of a whale fluke just before it re-enters the water and is dominated by flowing lines: the upper and lower wave create a clear structure. The architecture of the instrument panel is spectacular. The aluminium control elements have a functional and clean design, and provide an exciting contrast to the organic and avant-garde shapes that surround them. 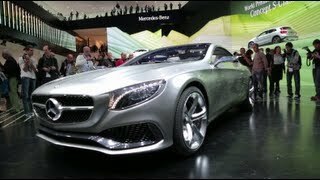 The Concept S-Class Coupé is powered by a V8 Biturbo engine producing 455 hp from a displacement of 4,663 cc and a peak torque of 700 Nm. The Concept S-Class Coupé is equipped with the "Intelligent Drive" technology from Mercedes-Benz.